A Democrat Ruminates On Ramadan: What Would Franklin Roosevelt Do? Ramadan ends this year on Friday, October 12. Imagine if we could transport President Franklin Roosevelt forward in time to preside over today's White House—the war against this generation's burden of fascism (the one in turbans) would be conducted quite differently. Of that we can be sure. First and foremost, FDR would not be opening the White House to Islamist enemies in a masochistic effort to "reach out" to Muslims as George Bush has done. Roosevelt didn't engage in touchy-feely pleasantries with enemies because he was busy directing the armed forces to kill them. President Bush may believe he can please liberal critics by playing the compassion card with A-list Muslims in White House fetes celebrating Islamic holidays. But as Diana West pointed out on the occasion of Bush's seventh Iftar dinner (noting the end of the Ramadan month of daylight fasting), preparing the guest list for such occasions has special challenges, in particular avoiding Muslims with unreconstructed views. "Take Talal Eid. In 2006, Eid gave the blessing at the White House Ramadan dinner, and this year Bush appointed him to the U.S. Commission on International Religious Freedom. As Robert Spencer has reported, Eid is a Wahhabi-trained imam certified by the anti-American Muslim World League who has actually called for the establishment of Sharia courts in the United States to regulate the family affairs of American Muslims. For welcoming remarks on October 4, Bush recycled his usual tired nonsense about Islam being a Religion of Peace and the suitability of Muslims to become Americans. THE PRESIDENT: "Thank you all for coming. Please be seated. Ramadan Mubarak. Laura and I are pleased to have you here for our seventh Iftaar dinner. Tonight we celebrate traditions of Islamic faith, which brings hope and comfort to more than a billion people. For Muslims around the world, the holy month of Ramadan is a special time of prayer and fasting. It is a time for charity and service to those less fortunate. It's a time to celebrate Islam's learned and vibrant culture, which has enriched civilization for centuries. Muslim infiltrators must not have heard about Bush's earlier Iftars. Don't they know that President Bush added a Koran to the White House library in 2005? Because the attempts to kill Americans by Islamic immigrants has been continuing as before. Two Muslim students at the University of South Florida were arrested August 4 in South Carolina with pipe bombs and directions on a laptop for turning a remote-control toy into a detonation device. In June, an Islamic terror cell was disrupted as members were planning to blow up JFK Airport and the fuel pipeline serving it. In the so-called Fort Dix Six case, a group of foreign-born sons of Allah planned to massacre scores of soldiers on a New Jersey army base. The men were arrested in May and included three illegal aliens. We are now six years past 9/11, and the Bush administration cannot even eliminate the easy targets. White House leadership should have ended the dangerous diversity visa immediately after the attacks. But no. Franklin Roosevelt did not play around at the edges of war by professing friendship with the German and Japanese people, although he could have done. He understood that America had to achieve total victory before the US could redefine those national relationships. In today's politically-correct war, crushing the opponent is considered too rude to be contemplated. So US soldiers have been forced to accomplish an impossible task, that of nation-building among active hostiles rather than in a dispirited population that has accepted defeat. Osama bin Laden has stated his intention to murder four million Americans as part of his effort to establish a global Islamic state governed by sharia law. His goal is made easier by open borders, continued Muslim immigration, a foolish refugee policy and the growing availability of WMD from nukes to bioweapons. Roosevelt has been most criticized most for his toughness on the home front in the internment of Japanese-descended persons, including US citizens. It was widely believed at the time that Japanese living on the west coast would respond to ethnic ties if there was an invasion from Tokyo. Instead of offering false friendship to possibly dangerous foreigners residing in America, FDR locked them up. By 1945, over 31,000 suspected enemy aliens had been interned in INS camps and on military bases throughout the country. Not without reason. In 1942, eight German spies came ashore in the Hamptons from a submarine for the purpose of destroying important power plants. They were caught, tried and convicted in a military court. Six were executed—a sentence that Roosevelt approved. We are at war (we are told) now, But no similarly strong measures have taken place. Some convicted terrorists have been sent to prison, yet Muslim immigration continues as if 9/11 had never happened. Not all Muslims are terrorists. But almost all terrorists are Muslims. That fact should be enough to end immigration from terror-supporting states at the very least. Our government is supposed to protect our lives, not experiment with social engineering. But in fact the Bush administration just announced that it is raising refugee admissions to 80,000, including 12,000 Iraqis—even as American soldiers are still dying in that country. Does anyone believe that those refugees can be properly vetted from a security standpoint? Even apparently west-friendly Muslim immigrants have a way of reverting to radical training, which is preached in American mosques. Recent polling has shown that the idea of happy, assimilated Muslims living in America is a dangerous fantasy. A notable minority believe that suicide bombing is justified to protect Islam from infidels. Only around a quarter of those surveyed identify as being American. While many of us patriotic immigration reformers see Bush as a primarily Mexichurian President who never fails to service Mexico, his other strong allegiance is to his Saudi oil cronies. 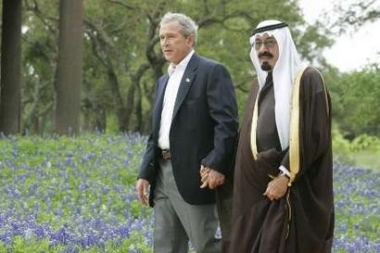 There are numerous photos of him holding hands and smooching with Saudi King Abdullah. The Bush family is oil connected, remember. So when the Saudi ruler decided in 2005 that sending thousands of young men to college in America would be a good idea, Bush made it happen, despite the obvious danger to citizens. What a war. What a President. Watching even the compromised Ken Burns' WWII documentary was a moving reminder of the unified America that has been squandered by open borders and diversity immigration. Franklin Roosevelt had the advantage of a national community that was already joined by culture, values and language. He could rally the American people with stirring words calling for sacrifice to win the war, and the positive response was predictable. George Bush, America's only MBA President, merely recommended that we continue to shop after being attacked. The opportunity to educate the people about the danger of fundamentalist Islam, let alone unassimilable immigration in general, has been largely lost. We can't win a politically-correct war—one in which the enemies are not clearly named by the Commander in Chief. 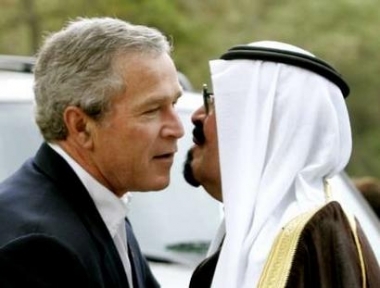 Give me an FDR Democrat any day compared to this Saudi-kissing Mexophile. Too bad there aren't any FDR Democrats left.